"Awesome views off the balcony and beautiful area." Have a question for The Cave Hotel? "Clean, huge room, super awesome service, simple yet delicious food, worth for every penny!" "The view from balcony was amazing in the morning." "Love this place so much, this is my second time staying in c..."
Designed for both business and leisure travel, The Cave Hotel is ideally situated in Kintamani; one of the city's most popular locales. From here, guests can enjoy easy access to all that the lively city has to offer. With its convenient location, the hotel offers easy access to the city's must-see destinations. 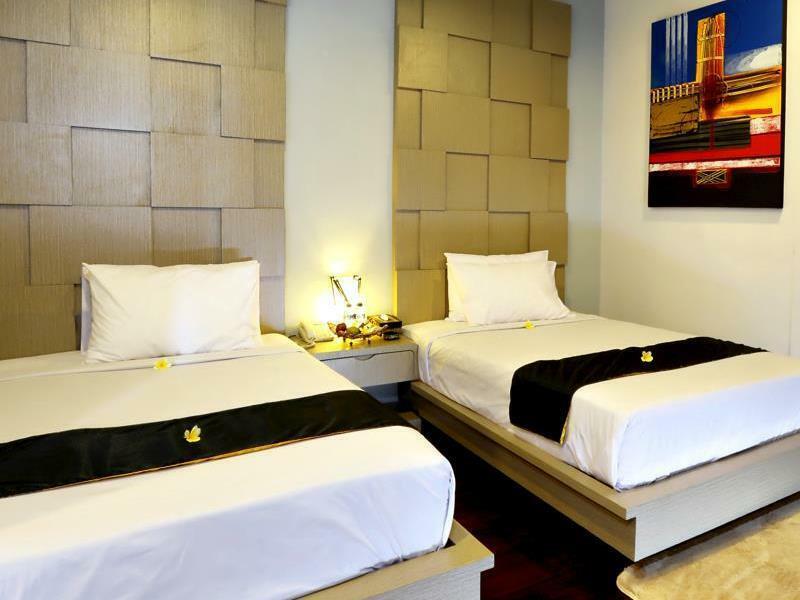 The Cave Hotel also offers many facilities to enrich your stay in Bali. This hotel offers numerous on-site facilities to satisfy even the most discerning guest. All guest accommodations feature thoughtful amenities to ensure an unparalleled sense of comfort. The complete list of recreational facilities is available at the hotel, including hot tub, fishing, water sports (non-motorized). Whatever your reason for visiting Bali, the The Cave Hotel is the perfect venue for an exhilarating and exciting break away. Each morning got to wake up to a sunrise between Mt. Abang and Mt. Agung (one that most people hike Mt. Batur to see). The restaurant options nearby are all local, but it's easy to get down the mountain to Kintamani town. One of the best places to escape the hot weather of Bali and enjoy nature. We stayed in the suite room , room was pretty good. But the view was awesome and very relaxing. We enjoyed our stay. Have to ignore few ants in balcony as this is a green area and tropical climate .No tea making facility and fridge in the room but not a deal breaker. I cant comment much about my stay when i changed a 2 night stay to just a mere check in and check out. If you decide to stay here, do not have any expectations. Here’s my feedback for the few hours there. Pros : - Spacious room (its room 5, located at the end of the stairway) - Had a big bed and another spare bed - Amazing view - TV Average : - Service Cons : - Stuffy and has a slight stale smell - NO air-conditioning which is normal in Kintamani - Only outlet was to open the door as no windows can be opened - If there are flies in the room, they will stay around buzzing - Soft bed - Standing shower-head was faulty Overall it was still ok as you dont get superb hotels in Kintamani. The location is so-so, and it's impossible to rent a motorcycle. A few good restaurants not too far but you need to ask. Breathtaking views you will never forget from the rooms. We stayed in the new wing. The room was smallish but the mattress was excellent and the balcony spacious. Nothing fancy for breakfast they bring to your room. Overall a good experience if you don't mind hiring a car and driver. the room was clean however there are a lot of bugs and flies at night, maybe due to the location. by sunrise, the flies all died on the floor of the balcony. our room was 01. Thus nearest to the lobby. wifi is very strong. breakfast was okay. there was only one power source for the tv thus we had to unplug the tv to charge our phones/cameras. basically you are paying for the view and location. Simple hotel, with clean room and awesome view from balcony. View of Kintamani lake and Mount Batur. Good for enjoy in the morning. The staf seemed not connected with the early breakfast as requested the night before, so i should make a long wait for the cooking before go trekking. Hotel is ok, possible to eat in restaurant near it for a good price (hotel customers get a discount in restaurant, all you can eat). We went there for a night to climb Batur Mount. Nice experience, need to leave hotel at 3am. Lots of people climb Batur Mount each night, we were around 100 I think. We asked reception if it's possible to go to Lovina with a transport service... They showed a panel with a price of 500 000 rp, which is exagerated for the distance... We said we are not interested and we went out of hotel to find other way of transportation.. we crossed the street and we saw directly infront of hotel a shop with a panel where it was written they provide transportation. We asked the price for Lovina and we were able to go there for 350 000 rp.. Staying there with my wife and baby. once enter a kind of smell in whole room. If u need hot water for drinks then must go to the lobby. Nite about 8pm rat enter my room from balcony.. About 9pm suddenly whole building lights out and wait for 20minutes. Morning breakfast was very small portion and taste very average.. they send it to our room. no any facilities outside. For my review its very expensive for what I get. I pay about eighty eight USD for 1 nite. View from balance is Amazing. otherwise it's a useless hotel. Pros: 10 minute drive to Mt Batur base camp. Awesome views off the balcony and beautiful area. Food was good. Excellent value. Cons: Woken by late check in guests who appeared to be screaming in hallway which was probably just echo due to the unique construction of the property. WiFi did not reach room. if trekking is your reason why you visit kintamani but waking up at 3.30 am (trekking normally starts at 4am) is not your thing, i suggest you better book your stay in this hotel. 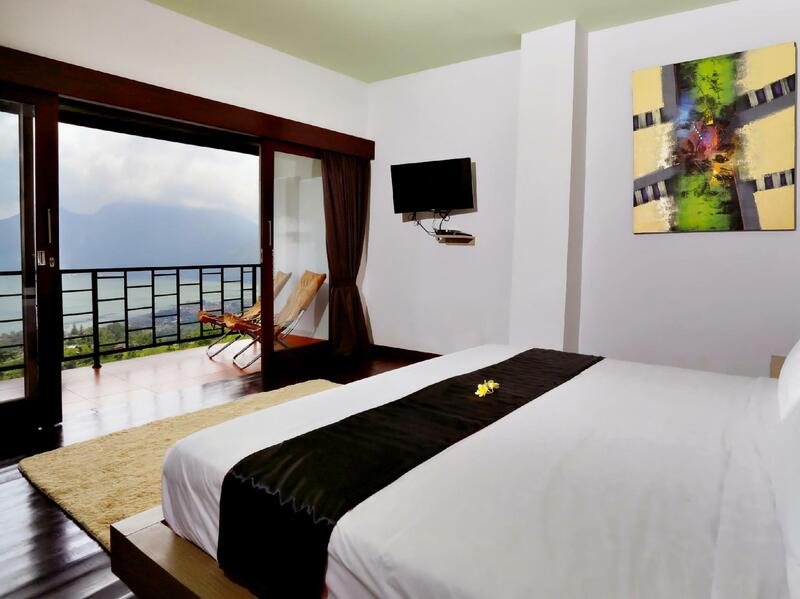 compared with other inns near the lake, this hotel offers room with perfect view of the mount Agung, Mount Batur and it's lake from your room's balcony. it is excellent for capturing photos of both sunrise and sunset. and they also serve breakfast right in your room so you have no excuses to miss the great morning. breakfast includes fresh fruits, juices, coffee, tea, bottled water plus the usual breakfast of either continental or indonesian breakfast. cave hotel also offers mount tour packages and could easily help you arrange a transport to your next destination. the staff are very helpful and friendly. the restaurant gives discount to their in-house guests for lunch buffet which has a wide selection of food. however, better plan to eat dinner in advance for the restaurant closes after 5 pm and the hotel room service is only up to 9 pm like the rest of the restaurants along the main road ( i personally do not recommend having dinner past 8pm outside the hotel since the weather could be cold and with zero visibility due to heavy clouds enfolding the area. had a great experience staying here! yes, you do pay for the view. But IT WAS TOTALLY WORTH IT!! Plus, the staffs are friendly. Bathroom blinds could have been repaired though. Theres a direct glare after sunrise and the blinds arent working. Million dollar view and breakfast was also good. Everything was perfect except the toilet flush. We changed our room because of the flush issue, but it was the same in the second room. Other than that it was a great stay and stuffs were very helpful. We stayed 2 nights in Cave hotel and I can say, this hotel has the best view I have ever seen! The view of lake and mountains is absolutely astonishing. The breakfast in the room is very delicious. Stuff is another great thing of this hotel. They are so amazing, nice and helpful! Firstly, the location is great since it has a famous restaurant next to it. 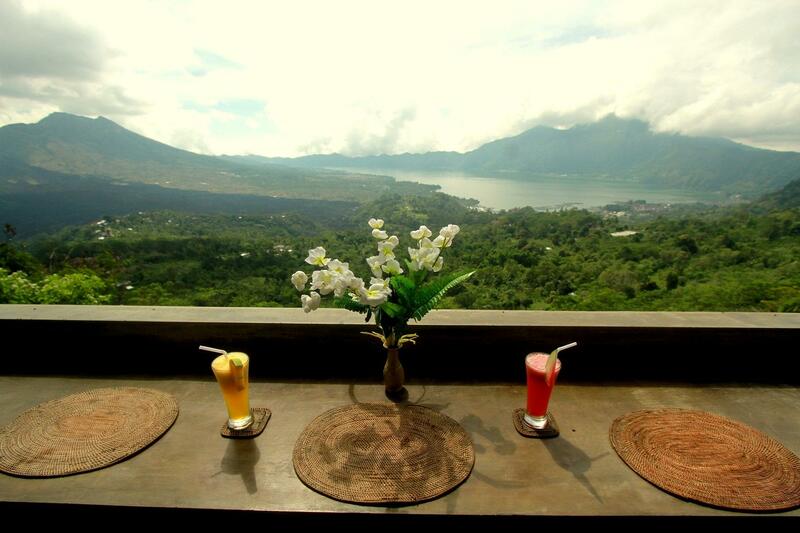 Secondly, the view from our room is exceedingly wonderful - facing the mountain and the lake Batur. It is really worth the money. Lastly, the staff are so friendly and their service is beyond satisfactory. The food is cheap aswell especially the fried bananas and french fries. We were truly blessed. stay one night at Cave Hotel, every room has private balcony, enjoy the wonderful sunset and sunrise view of batur volcano and lake, the staff is very friendly and helpful, food is good and very cheap at that tourist area.